Omar Suleiman, and the guy behind Omar Suleiman. Still from Egyptian television, widely available in public domain. 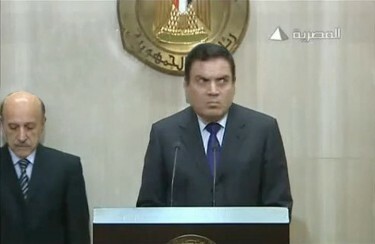 The mysterious individual appeared behind the Egyptian vice-president during his speeches throughout the unrest. No-one knew his name, nor what he does, but it did not prevented people from creating a Facebook page for him under, ‘The Guy Behind Omar Suleiman‘. @o_salem: For all those making fun of the guy behind Omar Soliman, please pay him some respect, this guy participated in three past wars and died twice before. Twitter user Malak El Ezzawy decided to mock Egyptian state television's lies and state of denial that lasted throughout the revolution. 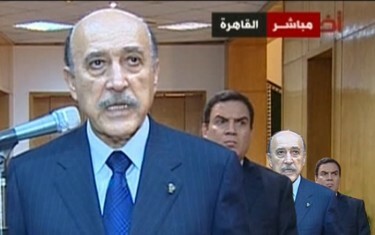 @ezzawy: Egyptian state TV: There was no one behind Omar Suleiman. There are also fake accounts on Twitter for the top figureheads of the toppled regime, including Hosni Mobarak and Habib El Adly, and sure enough they participated in the #TheGuyBehindOmarSuleiman phenomenon. 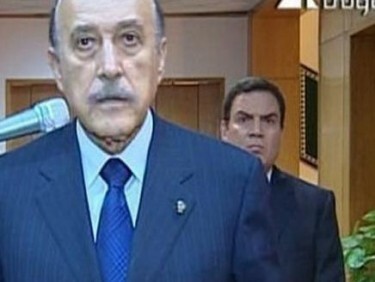 @HosniMobarak: I wish I was cool enough to have #TheGuyBehindOmarSuleiman stand behind me. The movie 'Inception' all over again… Image from TwitPic account BehindOmarSuleiman. What if Omar Suleiman and the man behind Omar Suleiman switched position? The camera man was just checking the white balance… Image from TwitPic account BehindOmarSuleiman. 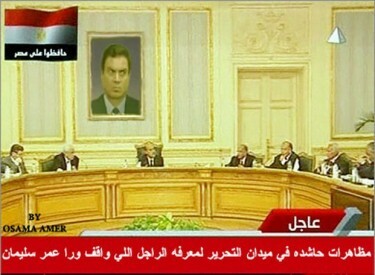 Mock Egyptian cabinet meeting held in front of a picture of the 'man behind Omar Suleiman'. The news feed at the bottom says "Huge demonstration held at Tahrir Square to discover the identity of the man behind Omar Suleiman". 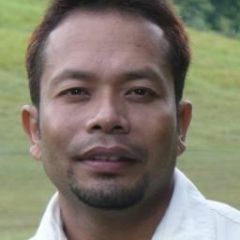 Image from TwitPic account BehindOmarSuleiman. Finally, the man was identified as Egyptian army lieutenant Colonel Hussein Sharif. 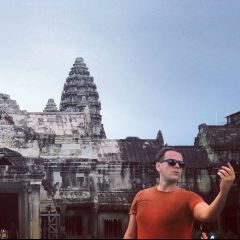 Many people believe now that it is not appropriate to make fun of him any more however, so the previously mentioned Facebook page has been deleted. A new one has since been created, asking people to apologise to him after making him the unwilling focus of so many jokes. Wishing the Egptions a peaceful demonstrations on friday the 18th. It is my understanding that the leader of Egypt persecuted the people. Inshallah, the new one will lead the people to peace.